Painting Without the Mess Featuring Kwik Stix from The Pencil Grip Inc.
Kwik Stix Solid Tempera Paint is one of the amazing products from The Pencil Grip, Inc. that crew members have been reviewing. Kiwk Stix are intended for everyday use without the mess of painting or the extra supplies like smocks, water or brushes. They are just as easy to use as markers, crayons, or glue sticks. The Kwik Stix 12 pk comes with a rainbow of vivid colors: from bright orange and yellow to bold blue and purple. The set even includes white and black. It’s a great palette of color for creative expression. Each paint stick is about the size of a glue stick, perfect for little hands to use. Caps pull on and off easily and the paint twists up, again just like a glue stick. Kwik Stix paint is designed to dry in only 90 seconds. Because the sticks are made of tempera paint, they give full bold coverage and dry with a finish just like paint. 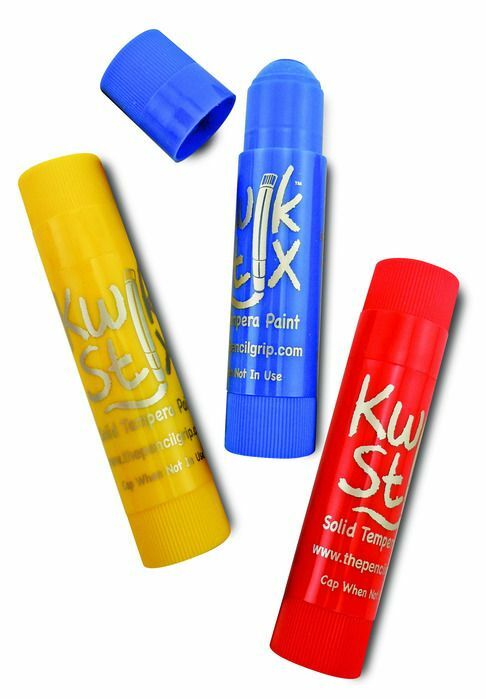 Kwik Stix can be used on a variety of surfaces including paper, cardboard, wood and canvas. A big thank you to Becky Marie of For This Season for writing this introductory post.